The analysis of genome-wide association studies (GWAS) poses statistical hurdles that have to be handled efficiently in order for the study to be successful. The two largest impediments in the analysis phase of the study are the multiple comparisons problem and maintaining robustness against confounding due to population admixture and stratification. For quantitative traits in family-based designs, Van Steen (1) proposed a two-stage testing strategy that can be considered a hybrid approach between family-based and population-based analysis. By including the population-based component into the family-based analysis, the Van Steen algorithm maximizes the statistical power, while at the same time, maintains the original robustness of family-based association tests (FBATs) (2–4). The Van Steen approach consists of two statistically independent steps, a screening step and a testing step. For all genotyped single nucleotide polymorphisms (SNPs), the screening step examines the evidence for association at a population-based level. Based on support for a potential genetic association from the screening step, the SNPs are prioritized for testing in the next step, where they are analyzed with a FBAT (3). By exploiting population-based information in the screening step that is not utilized in family-based association testing step, the two steps are statistically independent. Therefore, the use of the population-based data for the purposes of screening does not bias the FBAT statistic calculated in the testing step. Depending on the trait type and the ascertainment conditions, Van Steen-type testing strategies can achieve statistical power levels that are comparable to those of population-based studies with the same number of probands. In this chapter, we review the original Van Steen algorithm, its numerous extensions, and discuss its advantages and disadvantages. Lange, C., Van Steen, K., Andrew, T., Lyon, H., DeMeo, D., Murphy, A., Silverman, E., A, M., Weiss, S., and Laird, N. (2004). A family-based association test for repeatedly measured quantitative traits adjusting for unknown environmental and/or polygenic effects. 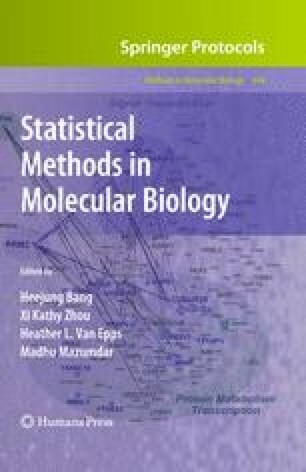 Statistical Applications in Genetics and Molecular Biology: Vol. 3: No. 1, Article 17. http://www.bepress.com/sagmb/vol3/iss1/art17.